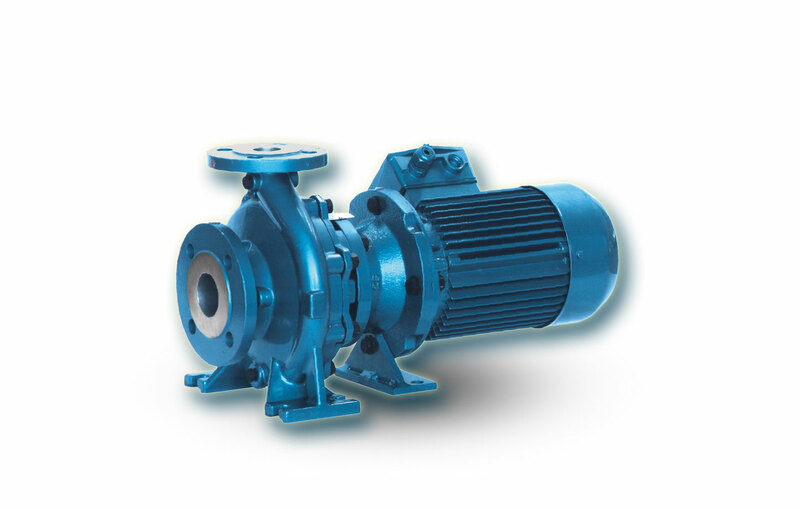 Built according to ISO standard 2858 and 5199 these sturdy and reliable pumps are available at low price coupled with the easy operation of monobloc units. The series TCHM and TCTM of Travaini are of the highest quality, with attractive prices to the Chemical and Industry in general. The connections are flanged to UNI2223-2229 NP16 standard. Liquids up to 140 Deg C can be handled. These pumps can cover a wider range of duties and applications than ordinary monoblock pumps and those pumps which are stamped out of sheet metal. Impellers are sized to meet the specific working point. NPSH requirements are extremely low and hydraulic efficiency is high. Customisation is possible at the standard price. Available in Ductile iron, 316 stainless steel, Hastelloy C and Alloy 20 for resistance to wear and corrosion. Performance is therefore assured for a long life. Shrouded and vortex type impellers are available to handle either clean or contaminated liquid. This widens the application of these pumps. The casings, impellers and casing covers are the same as for type TCH and TCT. This reduces inventory costs and the provision of spare parts at reduced prices. 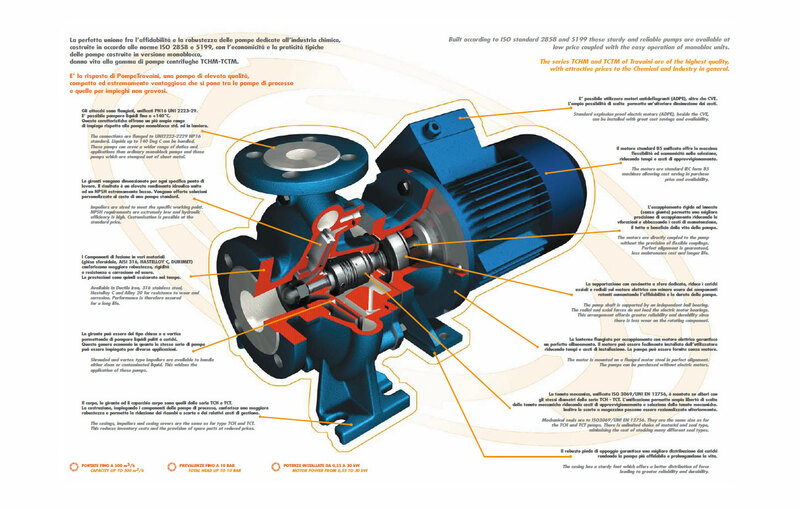 Standard explosion proof electric motors (ADPE), beside the CVE, can be installed with great cost savings and availability. The motors are standard IEC form B5 machines allowing cost saving in purchase price and availability. 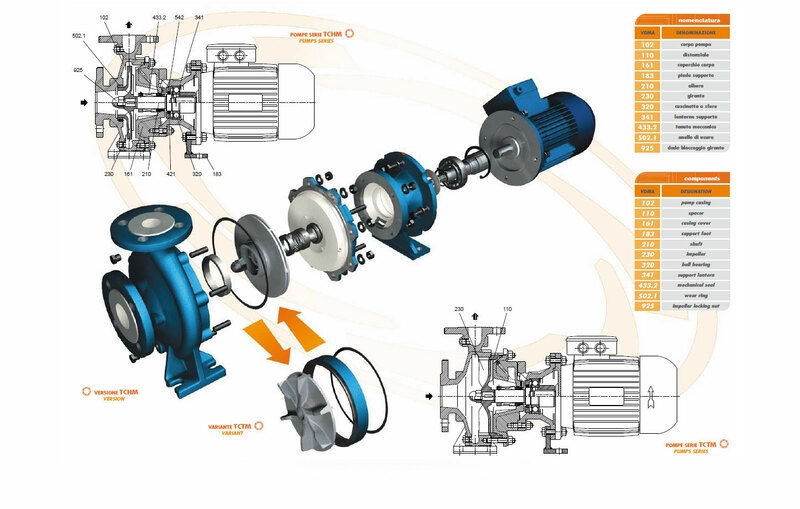 The motors are directly coupled to the pump without the provision of flexible couplings. Perfect alignment is guaranteed, less maintenance cost and longer life. The pump shaft is supported by an independent ball bearing. The radial and axial forces do not load the electric motor bearings. This arrangement affords greater reliability and durability since there is less wear on the rotating component. The motor is mounted on a flanged motor stool in perfect alignment. The pumps can be purchased without electric motors. Mechanical seals are to ISO3069/UNI EN 12756. They are the same size as for the TCH and TCT pumps. There is unlimited choice of material and seal type, minimising the cost of stocking many different seal types. The casing has a sturdy foot which offers a better distribution of force leading to greater reliability and durability.